President Trump today said he’d be very disappointed in Kim Jong Un if the CSIS Beyond Parallel reports are accurate that North Korea has begun rebuilding a missile test site it dismantled last year, as Bloomberg’s Jennifer Jacobs and Shannon Perry piece report. NBC's Andrea Mitchell first reported on the CSIS analysis of commercially available satellite imagery last night. Dive Deeper: “After Hanoi Summit: Rebuilding of Sohae Launch Facility,” by CSIS’s Joseph Bermudez and Victor Cha. Cyberattacks linked to Iranian hackers have targeted thousands of people at more than 200 companies over the past two years, Microsoft said today, as the WSJ’s Robert McMillan reports. America’s trade deficit with the rest of the world rose to its highest level in history last year as the United States imported more goods than ever, including a record amount from China, ballooning the deficit to $891.3 billion and delivering a setback to President Trump’s goal of narrowing that gap, as the NYT’s Jim Tankersley and Ana Swanson report. Dive Deeper: “Critical Questions: Up and Up: The Growing Trade Deficit,” by CSIS’s Bill Reinsch and Jonathan Robinson. The United States trade deficit soared to a record level of $891.3 billion with the rest of the world. CSIS's Aerospace Security Project has revamped its brief overview of the U.S. Air Force’s operational mobility aircraft, including airframe specs, fiscal data, and missions. 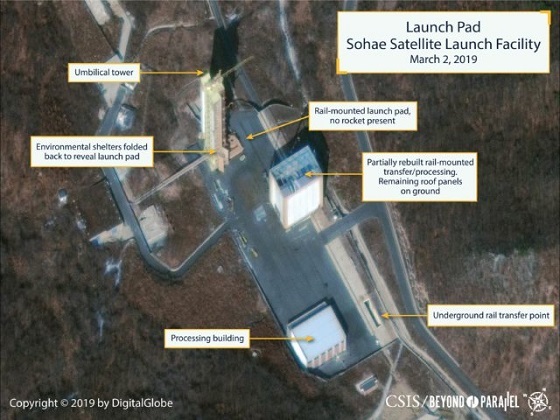 CSIS satellite imagery taken 2 days after the inconclusive second Trump-Kim summit in Hanoi reveal that North Korea has begun rebuilding the long-range rocket site at Sohae (Tongchang-ri). It is believed that North Korea resumed construction sometime between February 20 and March 2. “‘Assad or We Burn the Country’: How the Syrian Regime Prevailed,” by the WSJ’s Raja Abdulrahim. At 10:00 a.m., CSIS host a discussion of Sustainable Development Goal#17. The discussion will cover the need for innovative partnerships between governments, the private sector, civil society and other actors to reach the 2030 goals. Then at 1:15 p.m., stick around at CSIS for a conversation covering the aftermath of the Hanoi summit. The event will feature a keynote by Sen. Cory Gardner (R-CO) and be preceded by a panel discussion of experts. And finally, at 5:30 p.m., CSIS host the next installment of its Smart Women Smart Power series, featuring Dr. Jody Olsen, Peace Corps Director. Dr. Olsen will discuss the importance of the Peace Corps for international development and women’s empowerment. Today, CSIS Beyond Parallel project released a report using satellite imagery to show rebuilding at North Korea’s Sohae launch facility. To see more of CSIS’s work with satellite imagery in North Korea, check out our new series High Resolution. Watch the first video here. Have you seen the third season of “True Detective” which just completed on HBO? I loved it—not as much as the first season with McConaughey and Harrelson, but it was still really good. Mahershala Ali and Stephen Dorff were excellent. The haunting opening theme song by Cassandra Wilson, a cover of Son House’s “Death Letter” is really serious too.